Linda Greenlaw has posted bail and has been released from jail after being arrested by Canadian authorities for fishing in Canadian waters. According to the article, she headed back to sea to resume fishing and taping her NBC show "Sword." Ironically, because of the arrest, Greenlaw missed most of Hurricane Kyle. Downeast and midcoast Maine are now under Hurricane and Tropical Storm watches respectively, while down south here, we're under a coastal flood and high wind warning. If Kyle hits the coast of Maine as a hurricane, it will be the first to make landfall here since the 1960's. The Weather Channel has even sent weather tracker Jim Cantore to Lubec to report on the situation (his presence, if history serves, will make this a non-event). RG has headed north to the camp to move the boat over to a secure berth up river at the marina and move the kayaks from the float up on land above the projected flood mark. He's got supplies, a trusty Coleman battery-powered lantern, his wellies and his slicker (I'm at home as I've got a doctor's appointment that I can't miss). Seas in the Port Clyde/Cushing area are forecast to build to more than 20 feet--small for some parts of the Atlantic, but huge for our little part of the Gulf of Maine, and winds will be 50-75 mph. Here in the south, I'm cleaning out closets and hoping that the power will stay on and that we'll get the Battle of Ohio on TV today (GO Browns!!) while chewing Gaviscon like it's my job (I've got a fire in my belly and it's not fueled by picante sauce). UPDATE: Downeast, it's an event, but not a hurricane. 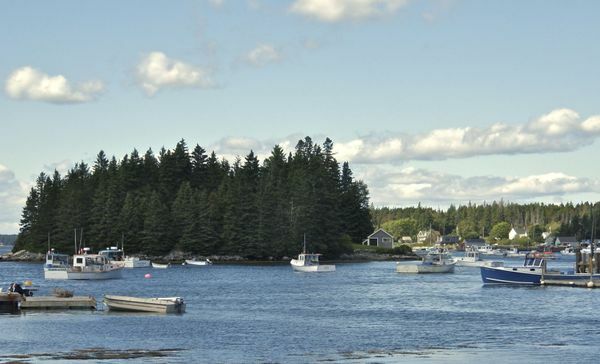 Fellow Mainer and famous author/fisherman, Linda Greenlaw, was arrested for fishing within Canada's 200 mile limit. She was filming a TV show when she was arrested, and I can't wait to watch this episode. There's got to be more to this story than we now know. 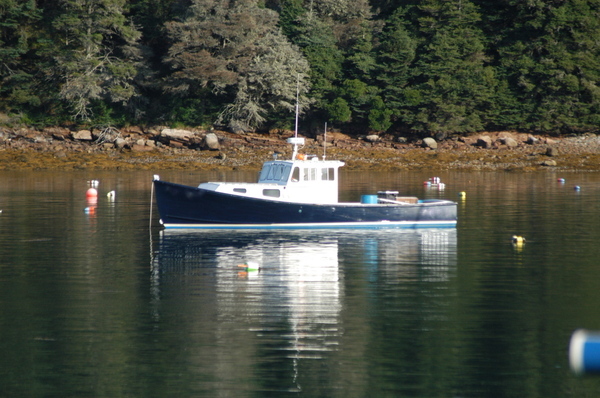 Above is a picture of Linda's lobster boat taken in August of 2006 off Isle au Haut (I've blocked out the name and lobster license number for her privacy). She was not on this boat when she was arrested. Greenlaw used to swordfish out of Gloucester, MA as the captain of the sword boat, Hannah Boden. The Hannah Boden was the sister ship to the Andrea Gail, which sunk in the Halloween Nor'easter of 1991. I was living on Cape Ann, not far from Gloucester, at the time of the storm, and the days after the storm were excruciating for all of us. Waiting for word from the Andrea Gail, knowing that there most likely wouldn't be any.... it was a rough week. Gloucester, Massachusetts has lost more than 5,000 men at sea in its 300 year fishing history, but it's always a horrible time--especially when there are no survivors and no real knowlege information on how loved ones were lost. I've always had an admiration for Linda Greenlaw, a woman in a man's industry, who was one of the best captains fishing at the time. She was the last to have contact with the Andrea Gail. She survived a 100-year storm through good judgment, brains and an iron will. And now she writes pretty good books. What's not to like about this woman? The bottom line on that shirt reads "Because Ohio is Never Right!" Ah. Now all we need is some apple cider, popcorn and a fire. I was just contacted by a very nice woman who holds the trademark for Palintology, and given that I don't hold myself above the law (I'd cooperate with an investigation of my ethics, as an example) and that I take copyright infringement very seriously, the Obessive/Compulsive site of all things Sarah Palin is hereby renamed Pales In Comparison and it can be found here. Yesterday started with a big banana-blueberry pancake breakfast with peppered smoked bacon, strawberries and vats of coffee, while we watched the mist clear from the river. 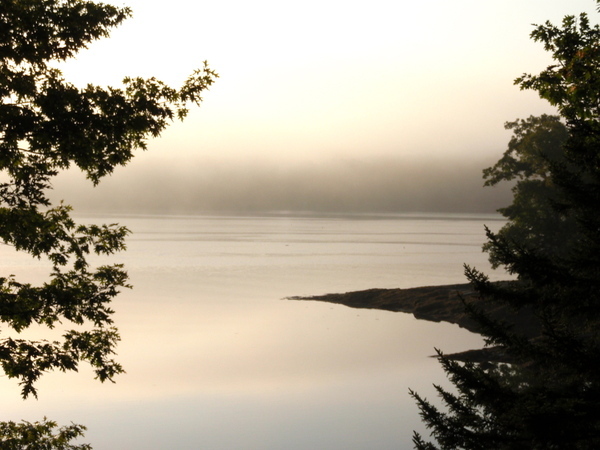 The delicious breakfast was compliments of Chef Hal, the view compliments of the last day of summer in Maine. 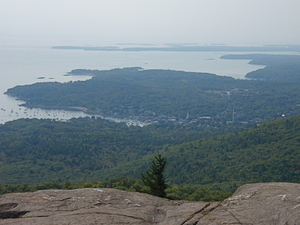 Then, to work off the pancakes (I'm pretty sure the bacon survived, as it wasn't a long trip) a hike up Megunticook Mountain for a view of the islands and Camden/Rockland to the south and east and Hope to the southwest. It wasn't a particularly clear day, as you can see from the shot at left, but the view was worth every single step. The hike up took about an hour and 15 minutes, the hike down an hour. 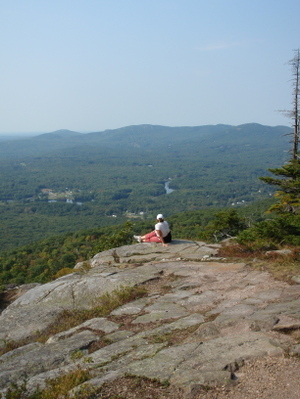 Should you find yourself in the Camden area this fall, the $3.00 per person to get into the Camden Hills State Park and the effort to get up the mountain is made all worth while by the view. 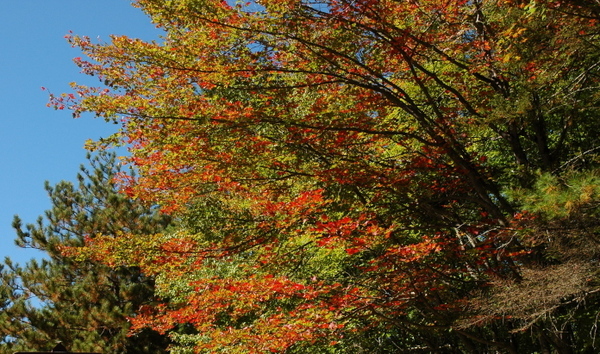 Within the next few weeks, the views of the foliage to the west should be spectacular. 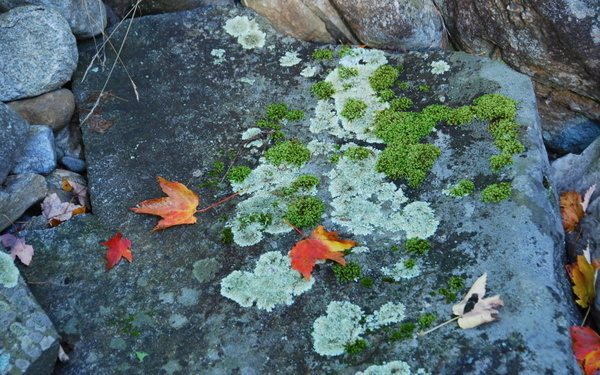 Yesterday, it was mostly green with just the beginning bits of color showing on the higher elevations. On Monday, we went down to the Dip Net (of course) for a quick lunch. RG had the fried scallop basket and I had the shrimp cakes with ginger sauce on a bed of wild greens. It was difficult to skip the fish chowder (I think it's the best in all of Maine) but the shrimp cakes looked too good. And they were. After lunch we walked over to the Puffin Stop gift shop and browsed the fridge magnets and T-shirts and chatted with the woman working the register. She allowed that living in Port Clyde in the winter could be lonely, but this last winter it was snowy. She was awfully glad that there wasn't much black ice though. The snow she could handle but that black ice is a killer. Then she said, "It's all worth it for the Port Clyde summahs, ayuh," and she gestured out the window to her view. I just had to take a picture, of course.